This evening, my black raspberries — running more than a week late this year, as you might expect — yielded the peak harvest of their (all too brief) season. Starting tomorrow, the daily take will grow steadily smaller. This means that summer is now exactly half over. 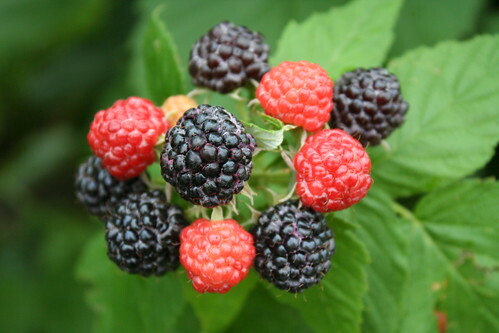 We love the black raspberry season. A few years ago we discovered that, even though they are wonderful just on their own, they are the base of a stupendous frozen yogurt. I forgot to add: the color alone makes the frozen yogurt delicious. You taste it with your eyes. I only have a small patch of plants and every year I keep forgetting to bury the ends of the canes so that they multiply. I got 2 cups of berries on Wednesday night and only half a cup tonight. And I didn’t remember to go check my favorite berrying spots this year so I missed out on a lot. I don’t want to live in a world without black raspberries. this is our september summer, isn’t it?